Try a profitable startup food business idea this week---make and sell chicken macaroni salad. Filipinos have their own casserole recipes---simple specialties that are usually localized to please our palate. One of the most popular of those is chicken macaroni salad, which usually serves as an ideal snack or appetizer. 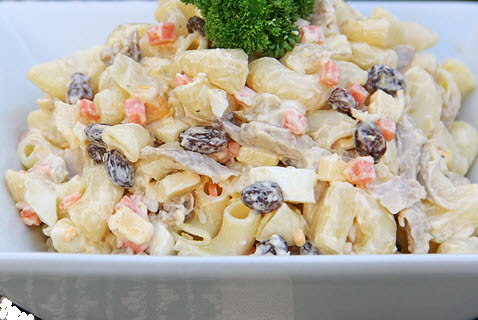 Chicken macaroni salad is another staple in most family gatherings, fiestas, picnics, and other occasions. Numerous restaurants have also included it in their menu. One major fastfood chain has it as among its popular add-in side-dishes. How about selling or taking orders for this casserole? You may be surprised how profitable making and selling chicken macaroni salad can be. Here’s a tried and tested recipe to get you started. Take note not to overcook your macaroni (which can also be replaced by other pasta like penne, mostaccioli, and rigatoni). 1. Cook chicken by putting it into boiling water. Add a teaspoon of salt. Let it cook over medium heat for about half an hour or until chicken meat gets soft. Drain water afterwards and let chicken cool down. 2. Shred the chicken meat using a fork or your clean hands. Set aside. 3. Cook elbow macaroni by following cooking instructions provided in the package. Drain and set aside. 4. In a huge mixing bowl or stainless bowl, combine mayonnaise, onion, pickles, salt, and pepper. Mix thoroughly. 5. Add macaroni, shredded chicken, minced carrots, pineapple tidbits, and raisins (optional). Thoroughly toss until all ingredients are ideally distributed. 6. Top with grated cheese and gently toss again. 7. Refrigerate for about an hour. Your chicken macaroni salad can now be served or delivered to your customers.